Tessa Gray should be happy- aren't all brides happy? Yet as she prepares for her wedding, a net of shadows begins to tighten around the Shadowhunters of the London Institute. A new demon appears, one linked by blood and secrecy to Mortmain, the man who plans to use his army of pitiless automatons, the Infernal Devices, to destroy the Shadowhunters. Mortmain needs only one last item to complete his plan. He needs Tessa. And Jem and Will, the boys who lay equal claim to Tessa's heart, will do anyting to save her. It brings me great sorrow to tell you all that I'm at the end of the journey with this amazing trilogy. I loved it!! Mainly one of the best trilogies I've ever read. I know I should have taken up Cassandra Clare in my early years of reading, but I just never had the time. I'm (hopefully) pulling through when I say I will get into the Mortal Instruments series! I'm way too excited to start. Overall although this book left me in shattered pieces and reading till 4 a.m. with a huge migraine, I loved loved loved it. 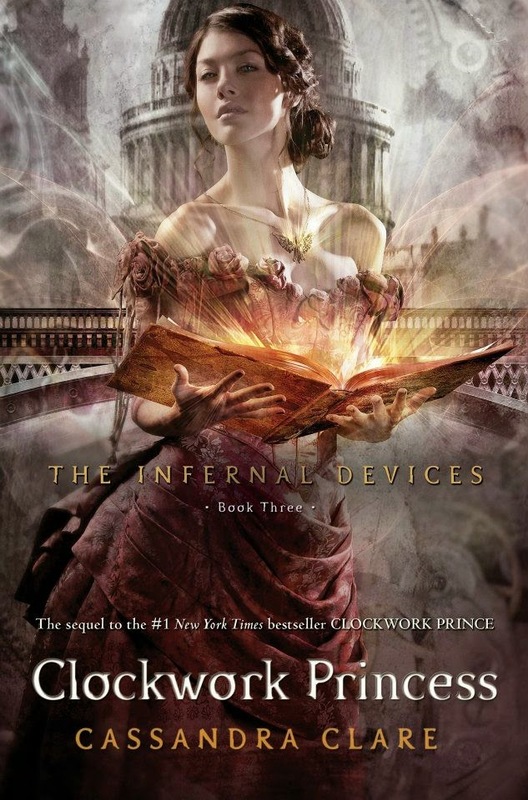 Cassandra Clare's Infernal Devices series now holds a true place in my heart- one I've been saving for a good fantasy series like this! First things first I've realized after finishing this book, that I feel like I was shot in the heart. And I had quite the fit of rage on my bed this morning as I was reading the Epilogue. We continue on from the second book where Will's sister, Cecily has found her way into the London Institute. Is Will happy to see her?? *shakes head* No, No, in fact, he screams and yells for her to return home. So blah blah blah skip skip skip, the Shadowhunters are faced with Mortmain and his Infernal Devices. After capturing Tessa and taking the last ingredient, his animated machines are filled with ruthless demons, who show no mercy on the Shadowhunters. We have Jem, on his deathbed. And Will, going after Tessa. As Will is riding to Idris (Where Mortmain is hiding), his parabatai rune- connecting Will and Jem as blood brothers- snaps signaling Jem's death. Tessa is soon found and told of Jem's death. Will and Tessa mourn but then. make love to each other after. I'm gonna stop right there and start to tell you why I'm so annoyed by this book. I loved loved loved this book. I really did. It was everything I'd hope for in a good YA fantasy thriller. But god, Tessa was killing me in this last book. First she get's engaged with Jem, even when she still bears feelings for Will. And then Jem dies, so she makes love with Will. Like seriously? If you hate love triangles as much as I do, this book is so not for you. But the romance was a beautiful thing in this book. And I like how Cassandra Clare masterly infused it into the action and conflict of the story. I must say that I really liked all the ships in this book. There was Gideon and Sophie. Cecily and Gabriel. And of course if you haven't already determined, I'm on team Will! I legit cried after reading this part. Tessa being a warlock, is immortal and watches Will die with Jem as a freaking Silent brother. And if you think Tessa didn't feel bad enough about Will's death then this is really going to kill you... She meets up with Jem at their yearly spot on the bridge, but Jem is different. No longer a silent brother, Tessa falls for him as she has always loved him and always will. They share a kiss on the bridge. I do indeed share a love and hate relationship with this book. But I really couldn't love this series more! If you're waiting to read from Cassandra Clare, there is no time to waste! You must finish the trilogy and come back to tell me if you're team Jem or Will. And I'm not going to give this trilogy four stars when I know in my heart that it deserves more. What an amazing trilogy- one that I will never ever forget! ALL HAIL CASSANDRA CLARE! I thought I'd let you know that I've nominated your blog for the Sisterhood of World Bloggers Award. If you're interested in doing it, check out my post! ALSO U MUST READ THE TRILOGY. I didn't realize what I was missing until I finished the last book! This book killed me as well, and by the epilogue I was surrounded by my own tears. I have to say Cassandra Clare made a good job joining two storylines from different trilogies together and in doing that she kept the fans happy by making possible both ships at the end. Yes she made is possible for both ships, but let's not forget that Will DIED!! I can't even say it D: OMG Im gonna cry! Thank god you're team Will. Well it's true what they say: Great minds do tend to think alike! Can't wait to start TMI, and I'm sorry to hear that lol! this entire book broke me, especially that ending..